Now I know this is a college football blog – but I can’t help but respond to some of the comments made in the reports of the Georgia men’s basketball team’s victory over Gonzaga yesterday. I’ve posted a couple of times about the inevitable negative effect a large playoff tourney for D-1 football would have on the regular season and my Exhibit “A” is college basketball. All the reports cite this non-conference game as a big win for Georgia, because it’s a public step in reestablishing the credibility of the program. The question is, towards what? For basketball, the regular season has been reduced to a mere means to an end. College football doesn’t need to make the same mistake. And since I’m on the topic of college basketball, doesn’t Greg Oden look like he’s about 32? Mark Schlabach at ESPN.com is reporting that there’s a new Dooley in town – Derek Dooley will be named the new head coach at Louisiana Tech. He’s also reporting that Coach Callaway has signed a 5 year deal at UAB. I hope it goes well for him. And with that, the speculation begins. The new helmet design has a unique paint job that changes color depending on the angle of the viewer and the lighting at the time and features silver flames below the paint fleck, much like a pimped-out El Camino. 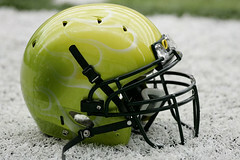 “A couple of people said it looked like tennis balls,” receiver James Finley said. “Honestly, it’s hard to say,” fellow receiver Jordan Kent said. “I’m speechless as far as the color, I can’t quite describe it. It’s sort of a lightning yellow but then it fades to a kind of lime-greenish. Yeah, you tell yourself that, kid. Comments Off on For the love of God, why?